Garthowen, Four Marks - Mag19.33 Dark Skies - Join today! Subscribe for your copy now! 'Look Up!' Out Now. 32 pages! HantsAstro is pleased to announce our third observing site which has now been made available to our registered membership. Garthowen Garden Centre outside Four Marks, Alton was visited by some of our Core Team members on the 5th March to carry out observing and sky quality metering. Situated just off the A31, Garthowen is within easy reach of a large number of our members, and lies just under 30 minutes to the North between Butser Ancient Farm and INTECH Science Centre & Planetarium. Under a full moon, Mag19.33 per arc/second resolution was achieved and the image above is the first example of what will prove to be a very useful dark sky site for observing and imaging. Our gratitude goes out to the Garthowen owners for making this site available to us. A revised timetable, together with a full overview, will be published in the next edition of Look Up! eZine, due out this month. 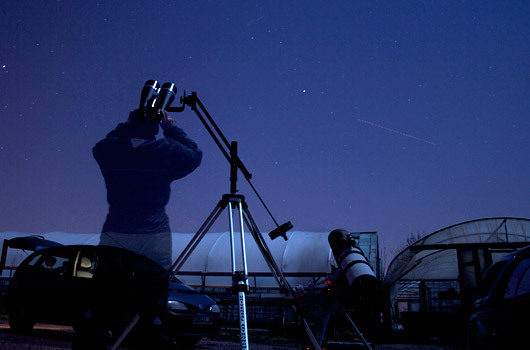 This site will only be available to registered members of HantsAstro. To join in download a membership application form today. For Garthowen there is a entry fee and refreshments and facilities are available. Please e-mail for more details. 50% of all fees go to the Hampshire & IOW Air Ambulance, Garthowen's chosen charity. We now have our own collection of eight telescopes, a 3" Refractor, 4" Maksutov, 5", two 6" Reflectors and a 10" Dobsonian are be used for general and deep sky observing, so you can experience the different advantages of different sizes and types of telescope that could help you develop your interest further. Or you can use your own, either way practice makes perfect and this site is great for astro imaging.